Scarlett Undercover is quick, fun, and fast-paced. The writing style and narration reads smoothly and the progression is pretty straight forward. Character-wise, it is quite non-mainstream, with a Muslim American teenager girl as the protagonist, who was also quite different in personality that the typical YA female heroine as well--definitely quite refreshing. I'm not familiar with Muslim culture or Islamic religion, so I can't really comment on the authenticity of the portrayal. But it was interesting, nonetheless--just as well, reading through the reviews on GR, there are some pretty conflicting opinions about how well Latham managed to write in the perspective of Scarlett and how well she presents the culture in this book. Again, I won't really comment on that aspect. 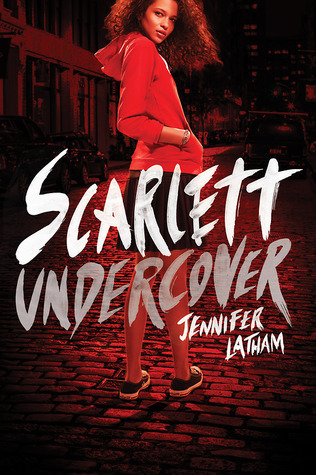 Instead, I'll just mention that, as a YA sleuthing crime thriller, Scarlett Undercover DOES cover a good sense of thrill and suspense. The mystery part of was quite predictable, though. And I would have liked to see more investigating going on rather than so much of Scarlett simply thrusting herself into reckless danger time and time again. Character developments were quite flat, though and I found myself not really caring much for any of them much... except maybe the dog, Jones. I like that Scarlett is different from other standard YA heroines--and I don't just mean because she's Muslim American. Scarlett is ballsy and snarky. And even though she turns out to be special, in a way, she never gives off that typical "The Special Chosen One" speshul snowflake vibe. She's just another teenage girl who happened to graduate high school early and now runs her own private investigating firm--as out of the ordinary as that description in itself sounds, Scarlett doesn't come off any more extraordinary than any other random girl you might know. I DO like the brief glimpses of those personal conflicting ideals Scarlett has, being born and raised in America surrounded by American ideals and behaviors, while simultaneously being raised in a Muslim family with her own cultural ways hanging in the background. Being exposed to two fairly different ways of life can be a confusing way to grow up--I'm quite familiar with this concept. There's that familial culture developed within you and that is a part of you, but you still try to break free of any part of your culture you don't quite agree with. Or you try to incorporate other aspects of the American culture you prefer, even if unsuccessfully because Mom and Dad don't like it or don't understand it. Or you try to explain aspects of your own culture to your mainly American group of friends you go to school with and they don't understand it or continue to be confused and now everyone thinks you're strange. Or cultural clashing happens between your native culture and the mainstream culture surrounding you, thus causing even more personality conflicts than you'd like to handle. And people thought just being a teenager was confusing enough. In Scarlett's case, it's between Muslim culture and American culture. In my case, I spent a lot of time growing up and trying to mold myself in one direction or another depending on which culture I'd just walked out of, Chinese culture versus American culture. You feel like an in-between--not quite American, not quite Chinese. And you spend the majority of your childhood and teenage years trying to figure out which direction to go or if you even need to go in any direction at all. Sometimes, it's still an ongoing battle depending on who you interact with even after years of being more comfortable with your lifestyle and accepting that both cultural aspects in your life need to just learn to live peacefully with each other. I hadn't quite been expecting it, so the slight supernatural aspects of parts of the book gave me pause. I liked how the book dove into history and used that as a baseboard for the case that Scarlett is working on. But the supernatural aspects were a little awkward being inserted into the story suddenly, and I can't quite put my finger on why. My only other complaint is that, despite liking how unique Scarlett is, I also have some issues with her dry snark, if only because it felt a little forced at times: sort of in a "Haha, I made a funny" type of way, but no one's really laughing cause we're not sure if it was really a joke or not. Otherwise, Scarlett Undercover was a pretty entertaining read. Even if I DID find some instances a bit meh. First of all, Yay! For Diversity! Secondly, I had only intended to read the first chapter or two to get a feel for how this book would be. After chapter 3, I knew that I would probably keep going if I didn't set it down. And I need to set it down for the time being so that I can finish the other book I'm reading. But Scarlett Undercover is proving pretty fast-paced with some ongoing action, even though it doesn't really feel like there's much action yet. But the book dives right into the story and I kind of like that in some books. The writing is par for young adult, done very well. I hope this says something about how well I'll enjoy the rest of the book.